Dr. Sarah Thompson is proud to be a preferred provider of Invisalign, a clear alternative to straighten your smile. 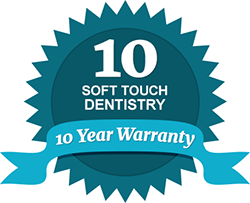 Soft Touch Dentistry is a comprehensive dental practice that treats patients of all ages in O'Fallon and the surrounding areas of St. Louis with a full range of restorative and cosmetic dental services. Our passion is to not only help you maintain healthy smile, but to give you an attractive, beautiful smile that you can be confident in. For patients who need orthodontic correction, yet do not want metal braces, we can help. Invisalign is an excellent solution for teens and adults who have teeth that are gapped, crowded or misaligned. Dr. Thompson is dedicated to staying at the forefront of dental technology and she can transform your smile using breakthrough techniques such as Invisalign. We strive to serve our patients in a comfortable, caring and stress-free environment at all times. Whether you have a mild bite irregularity or a major cosmetic concern, our experienced cosmetic dentist is equipped to address your needs. Invisalign is the preferred clear braces choice for adults, giving them an invisible orthodontic solution without the discomfort and embarrassment of traditional metal braces. Invisalign technology uses a series of clear custom-made aligners that slowly move your teeth into their proper position. Patients should expect to get a new aligner every 2 weeks until your ideal results are achieved. The aligners are fit precisely to your comfort level and they can be easily removed to eat, drink, brush and floss. Invisalign also gives patients a shorter orthodontic treatment time. Most patients gain their final smile correction results between 6 and 18 months after beginning treatment. Our office welcomes both adults and teens who are interested in a straighter smile using Invisalign. We accept most dental insurance and we have a variety of payment options, including flexible financing plans for your convenience. Contact Soft Touch Dentistry to schedule a consultation with Dr. Thompson and learn if you are a candidate for Invisalign today.